Businesses today strive hard to stay above competition. Most businesses understand that go gain this competitive edge, they need to remain in front of their customers at all times. As a result they end up investing in promotional calendar magnets. Logo imprinted promotional magnetic calendars offer 365 days of impression and aids to position your business contact information before potential customers in an impressive way. Here is all you ever wanted to know about them. Month wise calendars – Usually these calendars bear full twelve-month period information along with important contact details of the vendor. 6 month calendar magnets are equally popular as 12 month magnets. Organizational calendars – They bear important activity information, which the organization is going to undertake over the span of year. Business card calendar magnets are the most preferred item under this category. Tear off calendars – They are extremely popular with masses and usually they involve 31 pages for each month and you can literally scribble down some reminders over them. This type of calendar magnet often becomes addiction with masses and they depend on it for managing their daily routine and tasks. School calendars – No need to say what do they mean? Parents, teachers and students – conceive them as a matter of pride. These calendars are often retained as statement of confidence, pride and responsibility, even after the year rolls by. At times they may carry information about local school team and their schedules, school district testing schedules, etc. You are aware of regular business cards and why do people get bored of them easily. However, magnetic fridge calendars infuse business (business cards), entertainment (aesthetic appeal), utility value (date information) and unlimited fun (due to its inspiring shapes). This is why people see huge value in them. These magnets show how your business cares and supports clients. Most magnetic fridge calendars are offered in compact size and can be easily managed within pockets or bags. This means it is ideal to carry in bulk during promotional events, and business conventions. Many reputed online magnet stores offers brilliant bulk order benefits in form of free shipping, free art set up, free online design proof, and free design. These exotic sticky calendars remain largely affordable for all types of businesses and individuals. Many individual service businesses including plumbing, carpet cleaning and painting companies, pet care organizations, and electrical services – regularly use them for value building. Again real estate agencies, insurance agencies, attorneys, restaurants, pizzeria, hotels, holiday destinations, tour operators…………… have been using these calendar magnets to position their contact information in front of customers. 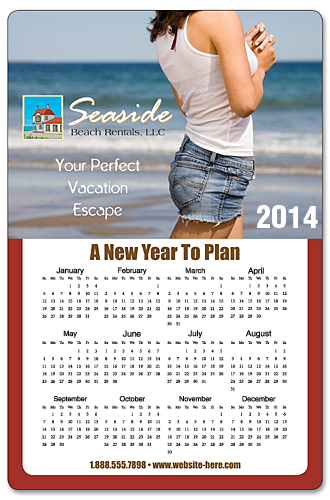 Huge discounts are also offered on orders of wholesale calendar magnets. Business information, organizational information or personal information when conveyed directly can be annoying. People often perceive such information as rubbish; however individuals and businesses can utilize the calendars for conveying their emotions without annoying anyone. They can boost interests by selling these custom magnets as fundraisers or handing them as an acknowledgement token.